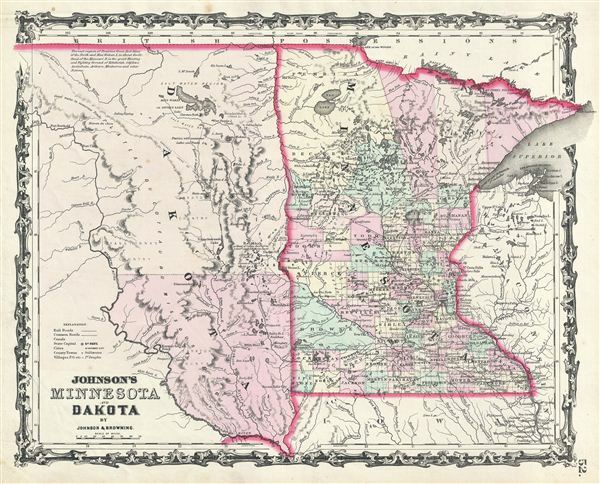 This is a beautiful example of A. J. Johnson and R. Browning's 1861 map of Minnesota and Dakota. It covers both states as well as adjacent parts of Wisconsin and Iowa. This map predates the splitting of the Dakotas and instead depicts them as a single great state bounded on the west by the Missouri River. The proposed northern route for the Pacific Railroad runs diagonally in a northwesterly direction across both Minnesota and Dakota. Also notes several American Indian nations including the Dakotah, Odjibwe, Assiniboin, Aikara, Minitarree and others. The map is color coded according to county and notes several towns, cities, rivers, railways and various other topographical details. It features the strapwork style border common to Johnson's atlas work from 1860 to 1863. Published by A. J. Johnson and Browning as plate no. 52 in the 1861 edition of Johnson's New Illustrated Family Atlas. This is the last edition of the Johnson Atlas to bear the 'Johnson and Browning' imprint. Subsequent editions reflect Ward's 1862 acquisition Ross C. Browning's shares in the firm. Very good. Blank on verso. Minor overall toning. Minor foxing.